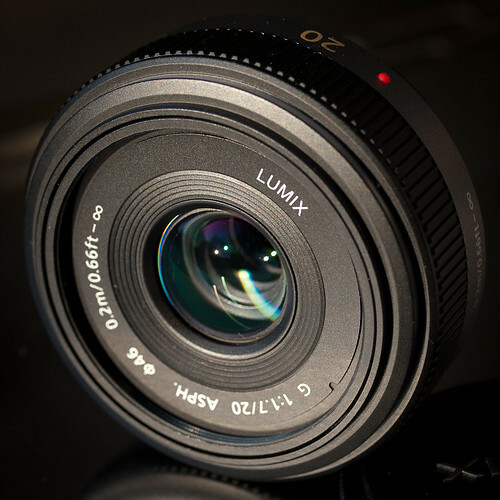 `thew's reviews: Panasonic Lumix G 20mm F1.7 ASPH. Yeah, but: So what took me so long? This is the second review of this lens. Matthew wrote the first, an excellent review when he purchased his copy over a year and a half ago. Rather than repeat what he wrote, I'll refer you to his review. I'll wait here while you go and read it. I first considered the 20mm when Matthew wrote his review. Unfortunately the price at that time for the 20mm was its MSRP of $400, or $150 more than the Olympus 17mm. So being the cheap guy that I am I purchased the 17mm and went off happily using it for all sorts of subjects, none the wiser. minus its front cosmetic outer ring. I even wrote a review about the 17mm not long after Matthew wrote his 20mm review, extolling the 17mm's virtues. Over the period I've owned the 17mm I've certainly taken my fair share of photographs with it. 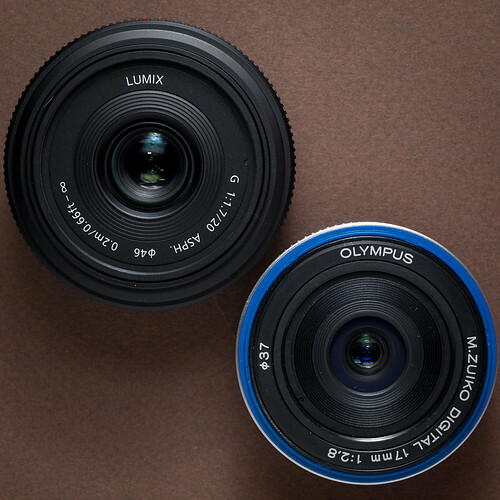 Yet, in spite of its lower price and slightly smaller size, there's one key feature that the Panasonic has that's superior to the 17mm; the 20mm is one-and-a-half stops faster than the 17mm. This feature alone makes it superior to the 17mm in very low light situations or situations where excellent separation of foreground subject from background is needed. When the price of the 20mm dropped to near $300 this past December, I finally purchased a copy for myself. As I mentioned one of the two key features I found attractive about this lens is its separation of foreground and background in a very tiny package. When the 20mm arrived the first thing I did was slap in on my E-P2, set it to f/1.7, turn the camera back around to face me and fire off this lovely portrait. 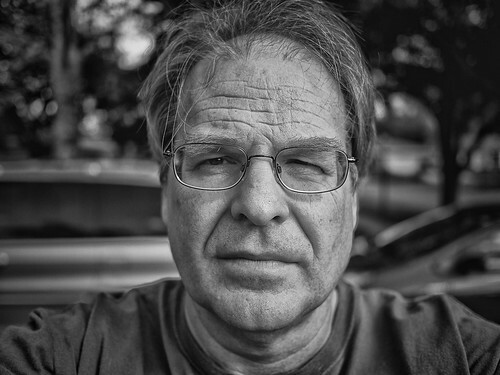 Look at the larger version (if you can stand to) and you'll note that elements in focus in the center part of the image are quite sharp and clear, such as my glasses frame, the dirt on my face, and the strands of my thinning hair straggling down over my furrowed brow. I also like the way that focus quite rapidly drops off, which you can see on the shoulders of my t-shirt. I've quickly come to appreciate the quality of this lens wide open, and make it a habit to shoot with it wide open as much as possible. 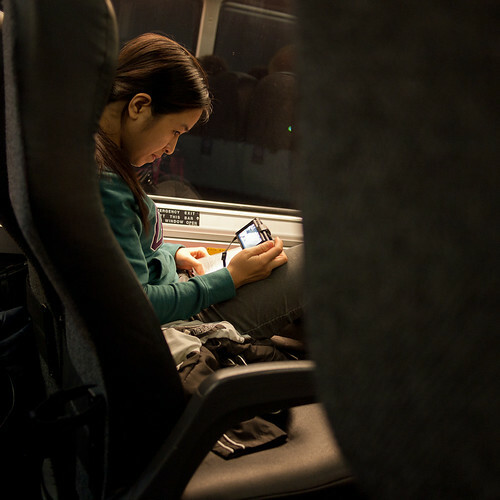 The lens' wide aperture of f/1.7 comes in handy in low-light situations. In this photo I was able to keep the ISO down to 400, which is only one stop faster than the E-P2's base ISO of 200. If I'd had the 17mm I would have had to move it up to ISO 1,000, where noise begins to show up. I know what's been written elsewhere about the E-P2's high ISO performance and how it's acceptable up to ISO 1,600, but it's been my experience to keep ISO as close to base as possible. So I juggle shutter speed, f-stop, and ISO in these situations, giving priority to keeping the ISO as low as practical. It's a shooting methodology I've had since my first days of 35mm film. After over 40 years of photography I much prefer to shoot no higher than ASAISO 400. Another feature I've come to appreciate with this lens is its apparent lack of barrel distortion or pin cushioning regardless of the aperture setting. The 17mm has noticeable pin cushioning wide open (f/2.8), which begins to clean up one stop down and is almost completely gone by f/5.6. But the 20mm doesn't have any to speak of, which makes shooting architecture a real joy, particularly when you don't have to clean up any distortion in post. 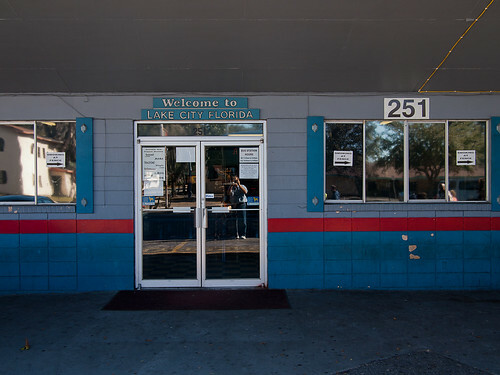 And if you think you see distortion above, let me assure you that the concrete sidewalk in front of that Greyhound station is actually warped. The 20mm also has a different color character from the 17mm. 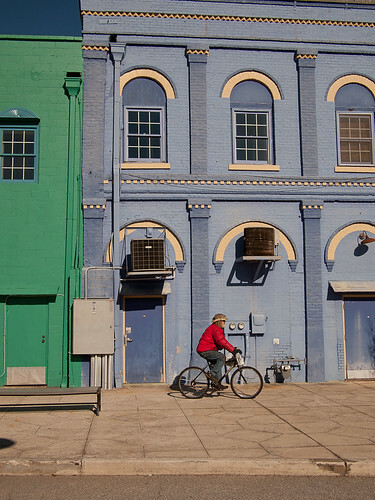 I can't quantify what is different about the 20mm, but I like the colors that come out of the 20mm mounted on the E-P2. 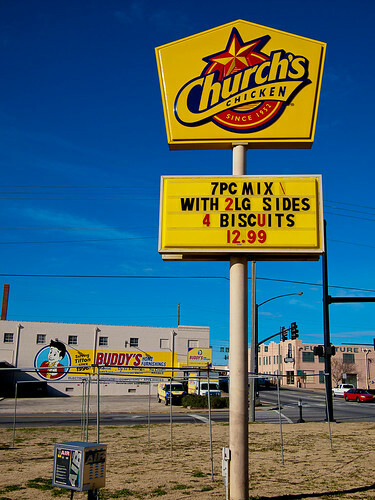 While the 17mm is quite capable of producing great color under the same lighting, I have to give the nod to the 20mm. The 20mm makes for a superb all-around travel lens, capable of rendering exquisite detail between f/5.6 to f/8 in broad daylight. The photo above was taken with the E-P2's ISO set to 200. The 20mm coupled with the dynamic range of the sensor at this ISO can produce some pretty remarkable results. Although the field of view of the 20mm is definately less than the 17mm (57° vs 65° respectively), it's still wide enough that with careful composition you can dramatically photograph large objects such as the DirecTV blimp. In the photo above the 20mm was stopped down to f/2.8 and ISO once again set to 100. 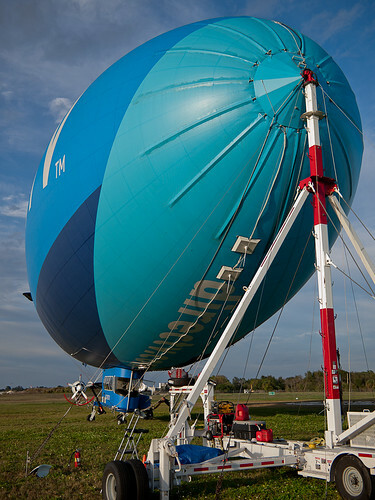 The lighting, the dynamic range, and the depth of field, coupled with the focal point gives the appearance of sharp focus from the mooring tower to the airship's tail. Yet the background is out of focus enough to help hold the viewer's attention on the airship. I can honestly say I could not have achieved this level of image quality with the 17mm at its widest, f/2.8. As good as the Olympus 17mm is, especially stopped down, the Panasonic 20mm is better, especially when you realize that the 20mm is already closed down 1 1/2 stops at f/2.8. While the 17mm is physically smaller, it's only barely so. The 20mm actually gives exposure "breathing room" to the E-P2, allowing it to be used at lower ISOs more consistently than with any other µ4/3rds lens except the M.Zuiko 45mm 1:1.8 (which I also now own) and the M.Zuiko 12mm 1:2. And with the drop in price of the 20mm bringing the price differential between the 17mm and the 20mm to less than $100, there's no real reason to purchase the 17mm independent of the 20mm any more. There's also the issue of build quality. I've groused about this already, but I'll say it again; ever since the early 1980s starting with Olympus OM equipment I've never had bits fall off of any Olympus lens, except for the 17mm. While I was on a trip to Boston last March the front outer ring over the blue plastic you see on the 17mm above simply fell off and onto the ground. I heard it hit but never found it in the street. The 17mm still functions, but the idea of something just falling off bothers me and gives the lens a bad mark in my book. The 20mm looks and feels better built than the 17mm. Hopefully nothing will fall off the 20mm during normal use. I'm glad I have the 17mm, and I'm glad I had it for as long as I did. It served yeoman duty and was the most used lens of all my regular and micro 4/3rds lenses. But I've got the 20mm now, and it's going to cut into the use of the 17mm considerably, and that seems a bit sad. I wish that Olympus had released an f/2 version of the 17mm, and beefed it up a bit, but Olympus was apparently working on the M.Zuiko 12mm 1:2. At its current price of around $700, I don't think I'll be picking up a copy any time soon, so the 17mm will take the spot the 12 would have if my budget would allow it. When Matthew wrote his review back in 2010 he called the Panasonic 20mm "the single best lens available for micro four-thirds cameras." While it now has to contend with the Olympus M.Zuiko 45mm and 12mm lenses, it still holds its own quite well with those two lenses. It isn't that the Panasonic 20mm is any worse for the Olympus lenses, it's that Olympus has finally stepped up its game to at least match the 20mm. The 20mm is still well worth the purchase, especially as part of a trifecta composed of the 12 and 45mm lenses.